The best place to stay in Lima has to be Miraflores, if you are a foreigner. There are other safe neighborhoods in the general vicinity as well. Barranco is also a good choice. They are completely different neighborhoods that offer something for everyone. Lima can be a rough city to stay in if you don't know where you are going or where to book your hotel. We spent about a week in Lima and are glad we did. Many skip this city and only use it as a portal in and out of the country, however there are tons of good things about Lima despite the gloomy skies and cool temperatures. What do you think about ceviche? Well if you love it, Lima is the place for you. We walked down a small street and found a hole in the wall place to get a snack. We weren't looking for anything too big, just something to tide us over until dinner. We stopped by a small family run place the size of a 1 car garage and decided to try the Ceviche. The cost was 7 soles a plate... a little over 2 US dollars. We ordered a beer and enjoyed our plate of ceviche while watching Peruvian soap-operas among the locals. The ceviche was incredible. Slightly spicy and tart, with onions, corn nuts (Cancha) and a slightly seared fish. They told us the name and it wasn't one we recognized. It was incredible. There are also a Michelin 3 star restaurant with a 17 course meal for 180 dollars, however we didn't go there. The food in Peru is generally great! We did have some less than appetizing meals in Lima proving that you need to be choosy in finding the right place to eat. This town is known world-wide for its cuisine and is a real up-and-comer in the foodie world tour bucket list. We however found much better food in Iquitos when we were there a month ago. 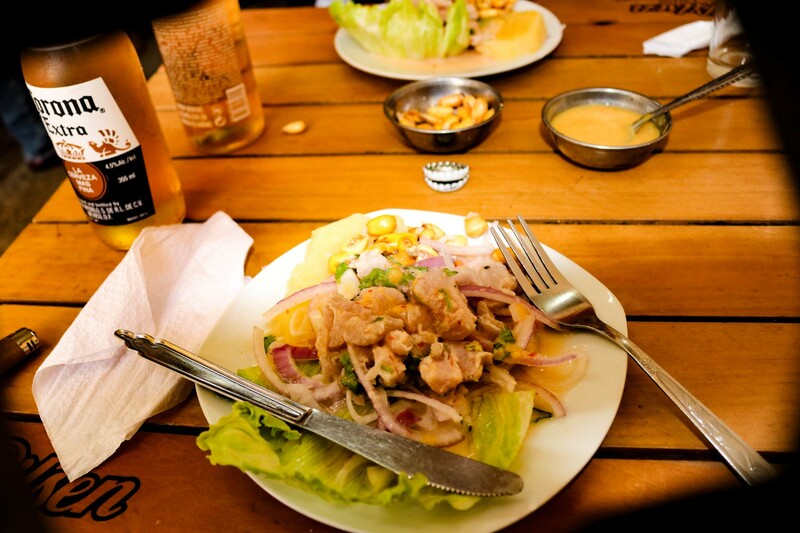 Miraflores has some great restaurants, however they also have some "gringo" places geared toward the tourism industry and tend to lean toward quantity instead of quality. When we got to Lima, we didn't know our head from a hole in the ground and didn't have any cell service. The airport has no wi-fi available and we hadn't booked a hotel before arriving. We are trying to stay in cheap accommodations this trip and asked a taxi driver out front. He made a phone call at 10pm and reserved us a hostel for $45 dollars in a private room. The taxi ride only cost us a mere $150 soles. Which is another 46 dollars which pretty much blew our budget for the day. Little did we know we could have taken a uber for a 10th of the price and found our own hostel for half the price. We ended up at the Lion Backpacker Hostel and the room was basic and small however they had a decent free breakfast. 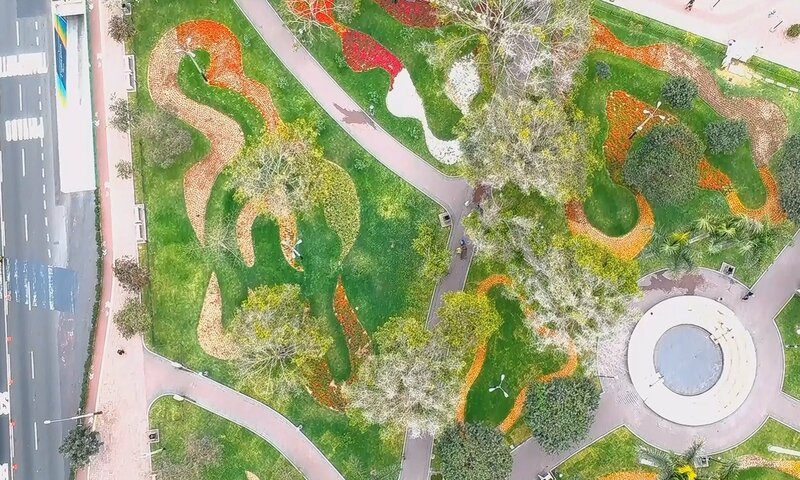 The location was in Miraflores and outside the main park a few blocks. We started looking the next day and found another hostel in the heart of the park area called Flying Dog Hostel. The pictures looked great and it was really close to the action. Once checking in the next day, we soon found out that the pictures didn't at all match the real decor inside. We were in an 8 bed shared dorm room for roughly 12 dollars each. In dorm rooms, there are lockers generally where you can lock up your valuables. The lockers here at the Flying Dog were a joke! Anyone with a phillips head screwdriver could unscrew the 4 screws holding down the clasp and runaway with your stuff. Good thing only a 3 other people were staying that room with us, which was another reason to leave. The place was empty and the staff disinterested in anything we had to say. We looked for another hostel and found one that suited us perfectly. We heard the Pariwana was a great place and decided to check it out. We walked over and immediately met a girl from Argentina named Marina. She was smiling, amiable and as we began to talk about Argentina we immediately developed a bond between us all. We immediately felt at home at the Pariwana and couldn't wait to move. Alas, they had no open rooms and we booked the next day and a few afterwards on the spot! The Pariwana can be classified as a party hostel, however compared to the Naked Tiger Hostel in Nicaragua, it was calm. There were nightly events including a Black and White Party, Beer Pong Tournament, Ping-Pong Tournaments and Salsa Dancing lessons. 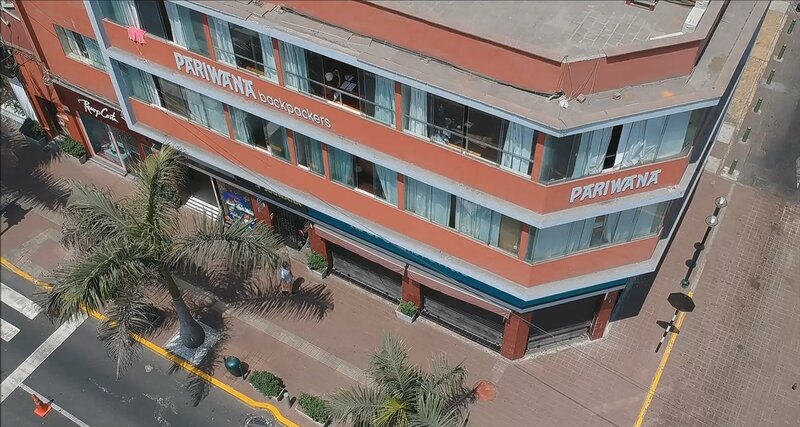 The Pariwana has a chilled out vibe with travelers coming in and out from all over the world. The dorm rooms were immaculate, the lockers secure, and they even had a small locker near the front desk if you wanted a personal place for passports and valuables. The people who run this hostel have it down! Daily housekeeping and turn-down service was a huge plus. The bathrooms actually had a checklist of times when they clean it every hour, and they were immaculate...always! The lockers were big and had power outlets in them which was convenient for charging your stuff when you weren't in the room. The beds were comfortable with each bed having a shelf which was nice to put your phone at night while charging. They even supply you with free ear plugs. They seemed to have thought of everything. Maybe the best thing about the hostel is if you reserve through their website you don't have to pay anything and you can run a tab and pay when you leave! They had a free continental breakfast that lacked protein, however was satisfying none the less. The coffee was good and the food off the menu was delicious. The we got to know the staff really well at Pariwana, including Marina, Ivan, Nicholas, and a few more I can't remember the names of. We never felt as if we were out-of-place and truly felt at home there. We got to be great friends with Marina and had some long, deep conversations about life. Sunday, she cooked up torta frita, which is fried dough that the Argentinians eat with Yerba Mate. We drank mate and ate torta frita until the late hours of the night. This hostel is a great place to meet up with travelers who are either leaving or arriving to Peru. We got a wealth of information from a bunch of people and found this place top-notch in the socialization department. All in all an incredible stay! There is everything from 5 star hotels to hostels in Miraflores and the area can't be beat for safety and beauty. No matter where you book, try to get close to Kennedy Park. There is a lot to choose from with entertainment and you care close to the coast, malls, restaurants, coffee shops and other activities. You can also stay in Barranco which is also safe and has a more bohemian vibe with its sidewalk cafes and professional graffiti murals painted all over the place. Another option is the coastal community of San Isidro. We didn't visit San Isidro and have no idea what it offers. One of the great things about Lima is that you can do a lot of free things. 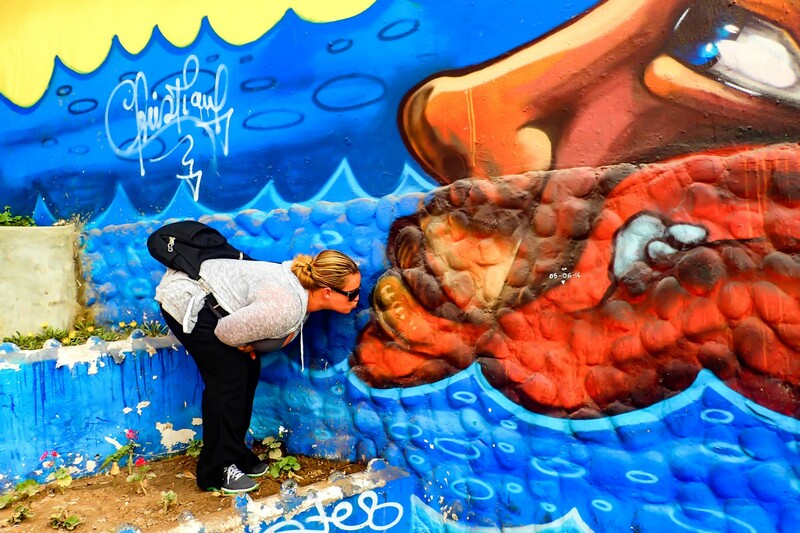 (or nearly free) We took the free Barranco Walking Tour. We had to pay for a bus which was only 1 sole (.33 cents) each way. Marina had the day off and decided to join us. We headed out and met up with the tour guide and group of people in the central plaza of Barranco near the Yellow Catholic Church. From there we began walking down toward the ocean to see the sights. The tour guide was not our cup of tea, however he did a fine job. We are just not "tour" people and within a few minutes we had split off from the crowd to explore on our own. We walked behind the tour group for a little while through various murals of local artists in the graffiti style. The colors were incredible and the artwork superb. We took a little break near a wooden ant sculpture made of small boards and relaxed to people watch. Once we had seen all there was to see, we headed down to catch a great sunset overlooking the ocean. It was nice to hangout and take in the culture of Barranco. It's a very artistic (bohemian) community and the restaurants we hear are great. We didn't eat in Barranco as it was a bit out of our price range and can be a little pricey for Peruvian standards. There are various walking tours that are free of charge all over the city. We just love people watching and Kennedy Park near the Catholic Church of the Miraculous Virgin is a great place to do this. There are sidewalk cafes and restaurants and park benches everywhere. This is a great place to see some local artisans who set up nearly nightly in the center to sell their stuff, and at night we would see musicians simply singing or performing in the park. The park if popular with tourists and locals alike who want to take a walk. There are also hundreds of cats in the park. Apparently it's a thing. People come from all over to feed the stray cats and most of them seem mild-tempered. We just love people watching and Kennedy Park near the Catholic Church of the Miraculous Virgin is a great place to do this. There are sidewalk cafes and restaurants and park benches everywhere. This is a great place to see some local artisans who set up nearly nightly in the center to sell their stuff, and at night we would see musicians simply singing or performing in the park. The park if popular with tourists and locals alike who want to take a walk. There are also hundreds of cats in the park. Apparently it's a thing. People come from all over to feed the stray cats and most of them seem mild-tempered. Hands down however the highlight is simply sitting on a park bench and watching the world go by, and there are few better places in Lima than here. There are more free things to do like walking down to El Malecon. The Malecon is a walkway that stretches several blocks and is loaded with little parks including the Parque Del Amor. The Lover's Park is a small park with a huge statue of two lovers in an embrace. "El Beso" (The Kiss) from Victor Delfín. It shows two lovers united in an intimate kiss. There are tile mosaics with sayings by various people throughout. The park is right on the bluffs and has stunning views of the Bay of Lima and coastline. There's also a parasailing port where you can do a tandem parasail over the cliffs or simply watch the pros take off and land from the walkway. A little further north from Lover's Park is El Faro de Marina which is a lighthouse. 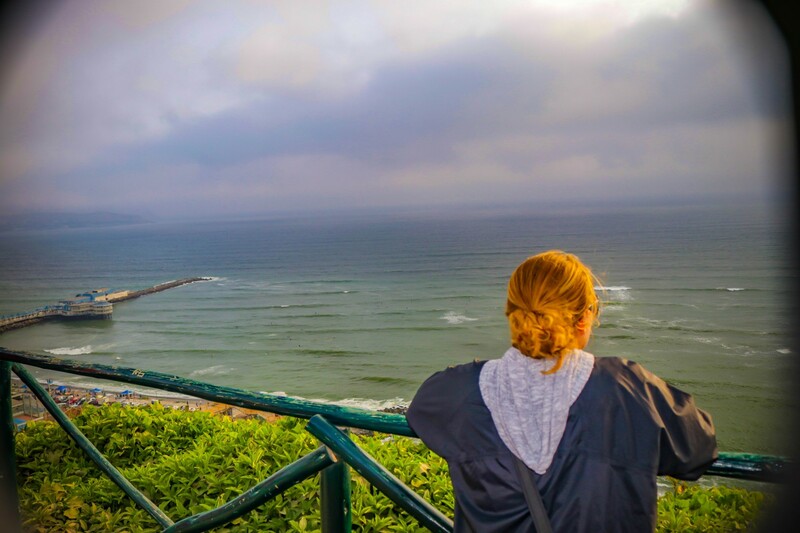 We really enjoyed walking down the Malecon of Miraflores, taking pictures and watching people in the park doing everything from tight rope walking to yoga. There are tons of restaurants and cafes along the way if you get hungry and although expensive, the setting can't be beat. We suggest you do this at sunset which has incredible ocean views perfect for sunset lovers like us. Arriving in Lima we didn't know what to expect. I guess the best thing to do is not expect anything, which is exactly what we did and it was incredible. Out of the entire stay in cloudy, cold Lima...(well 60s and cloudy, however it hasn't rained there in 20 years!!!) we can say without a doubt our favorite thing we did was meet a new friend. Marina was a breath of fresh air. Her smile and upbeat attitude brought sunshine to our trip. Albeit great the time we spent in Lima, by far the most profound were the friends we made. We met a guy from Holland named Tomas who was great, a couple from Australia, a guy from Israel, our Argentinian friends who worked there and many more. It was great expecting nothing and getting so much. It's important not to overlook the simple things you find while traveling and not look for just the great sights, amazing food or peculiar culture. Simple things like meeting new friends in the oddest of places... and it's totally free.